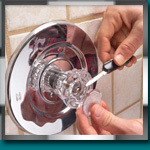 Houston residents have saved time, money, and hassle by calling us when their showers and shower pans start to leak. We're affordable, prompt and honest - and we have the experience and the training to fix your leaking shower Houston right the first time. When it comes to leak detection, two issues are critical for a successful outcome. The first issue that must be addressed is the personnel who will be conducting the task.